When you are looking for a simple solution to your budgeting problems, we are here to help you out. This Personal Bi-Weekly Budget Planner helps to keep things simple as you handle your finances and deal with all of the budget issues that comes up in your life. 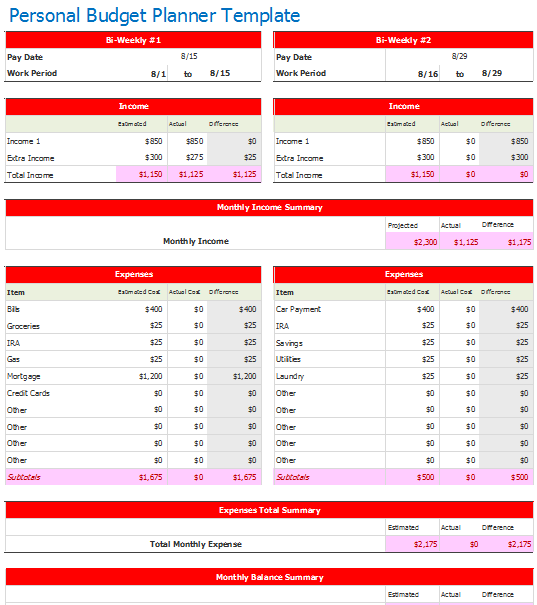 Through the help of this Bi-Weekly Personal Budget Planner, you will be able to track your income and your expenditures. This template has space for you to fill in the work period that you will be tracking, your projected monthly income, and more. When you use this template to help you stay organized, you will find that it is easy for you to stay financially smart. This template allows you to create a budget that fits you and your needs. You can customize this budget to fit your personal situation, and you can use it to make sure that your budget stays on track.